Serve up piping hot pancakes along with lakeside memories with this 2 dimensional laser cut serving tray. It’s a great conversational piece and can be used functionally or kept as a piece of display art. 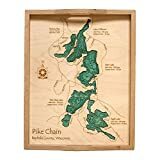 St Mary’s River (Sugar Island and Neebish Island) in Chippewa, MI – 3D Clock 17.5 IN – Laser carved wood nautical chart and topographic depth map.